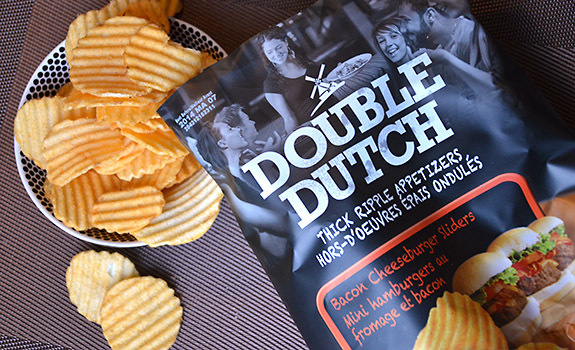 A bag of Double Dutch Bacon Cheeseburger Sliders potato chips. They’re appetizers, see? Totally not just regular old potato chips. I love Old Dutch Ketchup chips, and their Dutch Gourmet line has some curious flavours in it. Make no mistake; there’s no mercy for the weak in the world of potato chips. Flavours come and go based on sales, so I wanted to snag a bag of these before anything bad happened to them. The Pitch: “Thick ripple appetizers.” “Ultimate fusion of flavour and crunch. By fusing together thick cut maximum crunch ripple potato chips with the savoury flavour of Bacon Cheeseburger Sliders we created the ultimate appie snack for your next snack attack!” The idea of chips as a classy appetizer is a bit of a stretch. Similarly, calling it a bacon cheeseburger “slider” is also silly. It doesn’t sound as trendy, but plain old bacon cheeseburger is just as accurate. The Look: Thick-cut ripple chips with a light orange dusting of flavour. Dark packaging with big graphics that goes for a sophisticated look. An image on the front features a restaurant setting, which matches with the whole “appetizers” thing it’s trying to pull off. The Taste: Smoky fresh-from-the-grill barbecue taste without the “barbecue chip” flavour. A little bit like All Dressed, but with a lot of dill pickle, which I wasn’t expecting. Not sure if I love the texture; they’re crunchy, but not in the way kettle chips are crunchy. The flavouring could stand to be more present, if not more intense. Not bad overall. I’m curious to try the others. Cost: $4.19 for a 235 gram bag at Calgary Co-op. Availability: Widespread in Calgary. Possibly elsewhere. Nutrition? : Per 16 chips (50 grams): 240 calories, 10 grams of fat, 350 mg of sodium, 1 gram of fibre, 3 grams of protein. Also, 20% daily value of vitamin E, and 25% of vitamin C.
The verdict: Not bad. Not really an “appetizer” (nice try), but still decent chips. I like the concept of higher-end chips, but I can’t help but think kettle-style chips are where the premium market resides, and that ripple cut chips may never shake their basement birthday party rep. I have been a long time supporter of Old Dutch and it will take more than one dumb idea to change that. Now, the “cheeseburger slider” chips” I found were thoroughly disgusting and did not in any way taste like cheeseburger sliders at all, but more like “spam” flavoured chips. I tried them before a meal, after desert, and the following morning but the overwhelming taste of SPAM on a chip convinced me that it was not my palate but just a disgusting chip flavor. whom ever thought this one up should be FIRED. Just bought and tried the new Bacon Cheeseburger Sliders and sorry to say, they’re terrible. First thing I tasted was sugar, very disappointing. The potato part was tasteless. your regular ripple chips are far superior. Not boycotting Old Dutch for now, but staying with the established flavours. So surprised by the comments, these cheeseburger sliders are the bomb to me, theyre my favorite potato chips at the moment. Taste for yourself, youll either find them bad or REALLY love them like I do.